A vitamin booster so yummy it will make you jump out of bed. 2. Halve the plums and remove the stones. Slice bigger plums into six pieces, and smaller ones into four. 3. 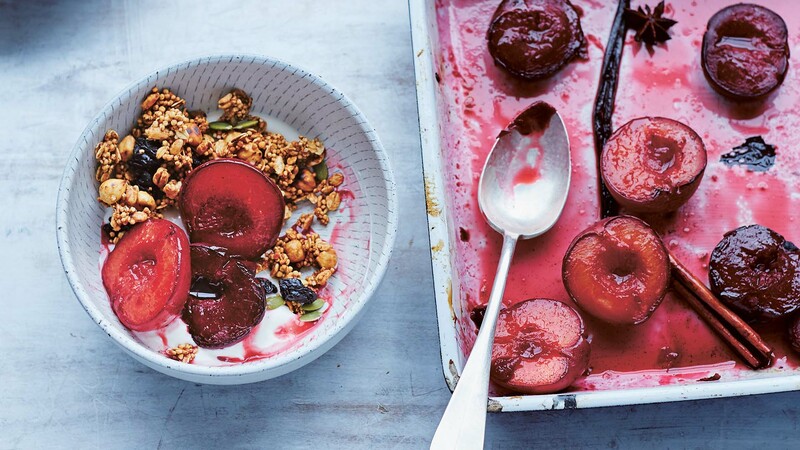 Pack plums into a roasting dish just big enough to fit the wedges in a single layer. 4. Slice the vanilla pod in half. Remove the seeds and add in the pods. Don’t worry if they’re in big clumps, they will disperse later on. 5. Add on cinnamon stick, star anise, nutmeg, sugar, agave nectar and 100 ml of water. Toss to combine and roast for 20 minutes (if your plums aren’t very ripe, they may need a little longer). 6. Serve sprinkled with the popped quinoa granola, a generous spoonful of natural yogurt and the spiced nectar from the roasting tin. Recipe from Skinny Salads by Kathryn Bruton, available in stores or online. Kathryn Bruton is a food writer and stylist hailing from Ireland and based in London.